Enjoy learning about diamonds on our website, and be further educated by email or phone at your convenience. We will provide you with one-on-one assistance and locate the most exceptional diamond from our trusted vendors to accommodate your needs. Peruse our database of thousands of diamonds. You can search by shape, carat weight, cut, clarity, color, and price range, and even save your quotes. Why Purchase a Diamond From Krikawa? Each diamond is analyzed in-house to determine whether it meets our strict standards of cut and brilliance. With our trained eyes, we will ensure that your diamond is beautiful and sparkly before making your engagement ring! If you provide your own stone, there is a setting charge added to the cost of the mounting. The fee is determined by the value and carat weight of your stone, as well as its hardness. It's a myth that EGL (European Gemological Laboratory) diamonds are "cheaper" than GIA diamonds. If you look at two identical diamonds in person, one having a GIA cert and one having an EGL cert, you will find that the price is fairly identical, also. What is different is that the EGL diamond may say G-VS2, while the GIA cert will say (accurately) I or J, SI2 or I1. EGL grades two or three steps higher than GIA! So, to say this a different way, if you look at two diamonds with identical certs, like a GIA F-VS2 and an EGL F-VS2, the EGL stone will be much less expensive. That's because the EGL stone is actually something like a H or I, SI2 or I1. The pricing for that stone will be consistent with a GIA stone that is graded as H/I - SI2-I1. 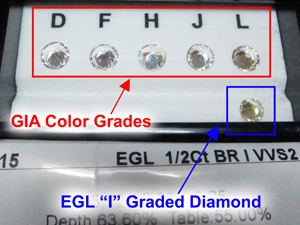 Shown on the left is a EGL I-graded diamond below a row of GIA color-graded stones. The EGL "I" color grade is much yellower! Bottom line, there are no "deals" when it comes to diamonds. Due to the difference in how strict the grading standards are between an EGL lab and GIA, please note that we can only guarantee any EGL Certified diamond graded G, VS2 or better to appear white and eye-clean. 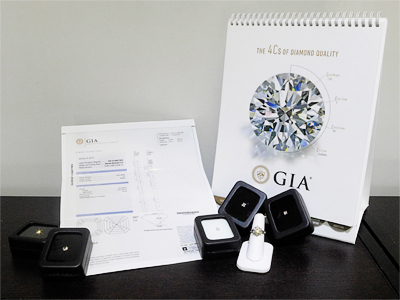 For GIA stones, we guarantee any diamond graded H, SI1 or better to appear white and eye-clean.